I have showed you hoe to change the default start up of terminal by customizing the .bashrc file. In this post I want to show you how to change the font,background etc of the terminal. We can set them without the use of Linux commands. Open your terminal and select Edit->Profiles. There you have an option to set the new profile name. After giving a proper name you can edit the profile as you want. You can change the font under General tab. You can also edit the cursor type. In Title and Command tab, you can edit the default title name 'Terminal' to whatever you like. On the Colors tab you can edit the foreground and background colors. Now click on the Background tab. Here you can set an image in your system as your terminal background. Also set the transparency level. Select your customized profile by selecting Terminal->Change Profile in the menu bar. 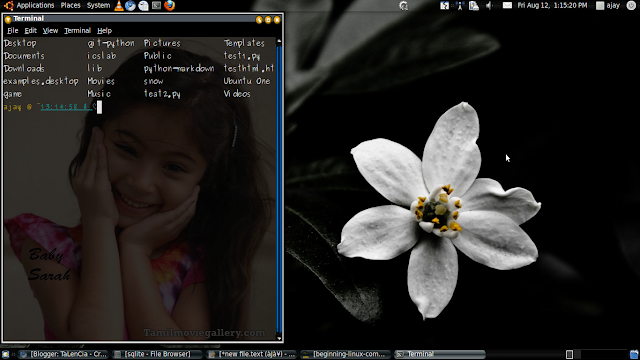 Now your terminal have entirely different look!!! Look at my customized terminal.